Bayern Munich bounced back from first leg defeat with a ruthless 6-1 victory over a bewildered Porto side at the Allianz Arena. Following the shock of falling to Porto by three goals to one in the first leg; it had been a tough week for not only Bayern Munich but also Pep Guardiola as frustrations boiled over with the long-serving medical staff. It was much more than a quarter final for the German side, and they had a massive job to do. Porto kicked off proceedings as a cauldron of noise rattled the Allianz Arena as Bayern Munich in their traditional striped red/blue home kit charged forward in the prospect of quickly pressing the visitors. Guardiola's men had no choice but to start swiftly and put the away side under immediate pressure. Lahm received possession on the right after a sequence of clever link-up play, but his cross didn't result in anything as Lewandowski's header was blocked well. Porto are a solid defensive unit, so it would have taken a lot to knock them down. As mentioned by Sky Sports commentators, a patient, frustrating night may have been in store for the home side. 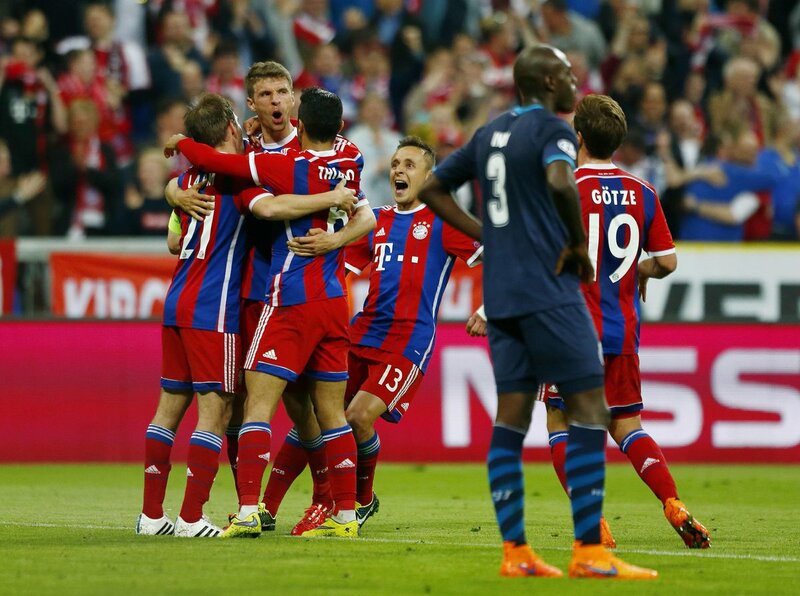 Bayern almost broke the early deadlock as Muller scampered through on goal. With a player to his left, the German fired a shot at goal, only to be denied by a solid Fabiano save. Lewndowski pounced onto the re-bound, but his toe-poke agonizingly clipped the post. Porto's defensive formation heading into the game may have ruptured their chances, as Bayern imminent closing the deficit, and then even surpassing it would result in another change in shape. Understandable in approaching the game defensively but also presented a risk. The hosts made a solid start, and their intentions were clear. Bernat linked up with his team-mate on the left, received the ball on the byline and whipped in a superb cross towards Thiago. The Spaniard escaped his marker, met the chance at close range and planted a solid header past Fabiano. Unlike the first leg; Bayern's passing and movement was so much more crisp. Porto were being hussled and harried at the back, again, unlike their previous meeting. After the home side's much-needed goal, all of the pressure suddenly stacked against Lopetegui's men. With just over twenty minutes played; Porto's deficit was wiped out at the hands of Boateng. A dangerous corner from the right swayed past a line of defenders, met Badstuber who knocked it forward and Boateng, with his back turned rose well to get a head on the ball and guide past past Fabiano. Confidence and fluidity was running through Guardiola's men, as they dictated almost everything on the pitch. Lahm met possession on the right, volleyed to Muller on the edge of the box, who then superbly continued the move by lifting the ball over to Lewandowski. Porto goalkeeper Fabiano didn't stand a chance of keeping this one out, as the Pole sped forward and guided a powerful header into the right hand corner. World class build up play, and as it stood, Bayern had done enough to proceed into the semis. Under a raucous home atmosphere like no other, the hosts were running riot with ten minutes remaining in the first half. Porto couldn't handle their speed, fluidity and Muller further empahzied that with a blistering run through the centre. Approaching enemy territory, he took a step to the right and fired a low shot at goal. Fabiano looked set to deny the German, but a big deflection off Martins Indi's leg took the a deflection and bundled past the Brazilian. Porto were absolutely shell-shocked. Muller dribbled across the right byline, held off his marker and cut back to Lewandowski who took a yard to his right and fired across goal into the bottom left corner. Absolutely fantastic assist by Muller, and the ever-clinical Pole finished to perfection. The half time whistle sounded, and Bayern marched off with flowing confidence after thumping five past their Porto, who strutted in for the interval absolutely stunned. They had felt the ultimate wrath of the German giants, and there was more in store. 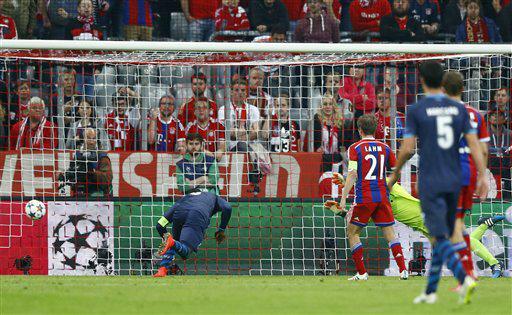 Bayern came racing out of the blocks, and Gotze almost made it six. The ball whipped into the area deflected and fell to the German but his strike just fired past Fabiano's post. The home side dominated possession in the mid stages of second half proceedings, but Pep Guardiola continued to shout from the touchline, as if a 5-0 lead wasn't enough! Porto were just beginning to creep back into the game, as Bayern calmed down from their rapid pace in the first half. Manuel Neuer hadn't been tested all night, but he conceded with under twenty minutes remaining. The ball was whipped over to Herrera on the right byline, who's low cross found Martinez poaching at close range. The Colombian tapped home to close the deficit. All of a sudden, Porto had Bayern pinned back in their own half, were dominating possession and creaitng chances for the first time in the match. The hosts took their foot off the gas, but when they did move forward, Lewandowski especially still carried real intent. Outside the area, he latched onto the ball, took a couple of strides and unleashed a grass-cutter. The effort just rolled past the post. Porto's sorry evening continued as a second yellow would send Marciano back into the changing rooms early. He had been booked earlier, and a reckless challenge on Thiago earned him a red card. From that free kick, Xabi Alonso wrapped the game up. A sweetly hit strike curled past the wall and then Fabiano into the left side of the goal. Fantastic effort by the Spaniard. Bayern also made it seven in stoppage time, as Muller and Lewandowski both came tantalizingly close to stretching their lead. Fabiano made two cracking saved to deny them at close range, and a block would prevent Rode from converting the rebound. The full time whistle sounded and a cauldron of noise erupted as Bayern dispatched Porto by a terrific six goals to one. They were excellent throughout and deserved such a thorough win. Despite dropping the pressure in the second half, Bayern Munich were absolutely terrific. Many doubted them, and they proved why nobody should with a ruthless performance. Porto never stood a chance once they found their rhythm and it remains to be seen if Pep Guardiola's men can go on and win the Champions League. Bayern Munich easily overturn the Porto deficit as they dismantle the Portugese in a 6-1 win at the Allianz Arena.